The new capability also stands to benefit the airline's Maintenance Repair and Overhaul or MRO business as Delta will work on engines from other airlines and aircraft operators. Delta TechOps serves more than 150 aviation and airline customers from around the world through its MRO business, specializing in high-skill work such as engines, components, avionics, airframe and line maintenance. Delta will be preparing the shop in the next few weeks, with its first engine induction set to take place in September. The airline is anticipating the first induction of the shop will be one of Virgin Atlantic's Trent 1000 engines. To build the brand new engine shop, Delta converted several large hangar bays at the airline's TechOps facility in Atlanta and created a workshop consisting of an engine assembly and disassembly area, a kitting parts area, engines work-in-progress area, shop materials and supplies (Kanban) area, life limited parts center of excellence, and repair and support area. The facility stands out from the adjacent aircraft hangar bays with a wall of glass consisting of more than 2,000 pieces of glass and stands seven stories tall underneath the historic Fly Delta Jets sign. The shop will support the airline's partnership with Rolls-Royce. Japan’s Skymark Airlines will be fitting the RECARO 177 BL3530 short-haul seat in three of its Boeing 737-800 jets in an order of over 500 units. Skymark Airlines was founded in 1996 as an independent domestic airline and is headquartered at Haneda Airport in Tokyo, Japan. It currently has a fleet of 27 Boeing 737-800 aircraft which service 11 destinations within the country. The majority of Skymark’s Boeing fleet is equipped with RECARO seats. The BL3530 seat has a high literature pocket, tablet PC holder, USB power supply, includes multiple stowage options for smaller personal items and weighs just over ten kilograms. 400,000 of the seats have been sold since its introduction. The light weight of the seat will help improve fuel costs, making the cost of traveling more affordable for Skymark passengers. MTU Maintenance has signed a contract with Jazeera Airways. The three-year contract covers the maintenance repair and overhaul of the CFM56-5B engines that power the airline’s fleet of A320 aircraft. 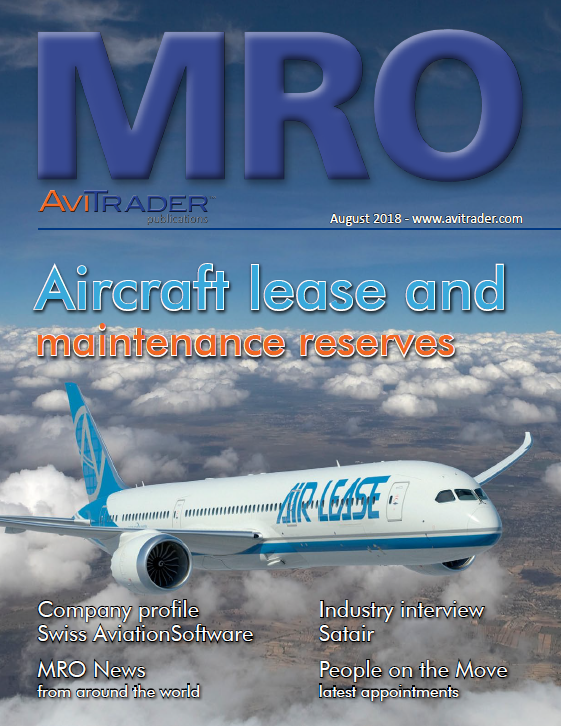 Jazeera Airways is MTU Maintenance’s first airline customer in Kuwait and continues the MRO provider’s successful trajectory in the Middle East market. Established in April 2004, Jazeera Airways is the first non-government owned airline in the Middle East, and the largest private airline operating out of Kuwait. Each year, Jazeera Airways serves over 2.2 million passengers, flying to 26 destinations across the Middle East, India and Europe. United Continental Holdings (UAL), the parent company of United Airlines, is transferring its stock exchange listing to The Nasdaq Global Select Market from The New York Stock Exchange. UAL expects its common stock to begin trading on the Nasdaq Global Select Market on Sept. 7, 2018 and will continue to be listed under the ticker symbol "UAL". "We look forward to our future partnership with Nasdaq. Their highly respected trading platform and marketing initiatives offer the most cost-effective listing alternative and support our work to deliver on our cost targets," said Gerry Laderman, EVP and CFO of UAL. Loss-making Tunisair is seeking governmental approval to lay off 1,200 of its currently bloated 8,000-staff workforce. The flag-carrying airline is 74% owned by the Tunisian government. The carrier is currently struggling to keep aircraft in service owing to restricted cash flow, the consequence of an excessive wage bill, which is stopping it from buying much needed parts. Currently it is operating only 24 of its fleet of 30 aircraft. Tunisair is also about to face stiffer competition from foreign airlines as the country prepares itself for joining the European Union’s Open Skies agreement. This will see all but Tunisair’s main-base airport, opened up, Tunis-Carthage International Airport will follow suit in four years’ time. Mankabi has also commented that: “It will not be easy for the company after Open Skies, (which could come into force this year), But we have a reform program for the company. If implemented, we will be in the right direction.” It is understood the restructuring plan will cost approximately one billion Tunisian dinars ($363 million). Tunisair intends to lease six aircraft in 2019 to boost its fleet as the airline launches two new routes in Africa to Sudan and Cameroon. Air Canada has appointed Ferio Pugliese as Senior Vice-President, Government Relations and Regional Markets. Pugliese is succeeding Kevin C. Howlett, Senior Vice-President, Government Relations and Regional Markets, who will be retiring in November after 45 years of dedicated service. Pugliese will be based in Toronto and will report directly to Calin Rovinescu, President and Chief Executive Officer. Tradewinds Aviation Services has implemented the departure control system (DCS) and weight and balance modules of Rockwell Collins’ PaxLinkSM passenger service system to support its ground handling services at Jomo Kenyatta and Mumbasa Moi International Airports in Kenya, Africa. ARINC PaxLink allows airlines and ground handlers to select from a number of options to create a tailored solution to streamline passenger check-in, boarding and flight load planning. It includes a reservations system, inventory management system, departure control system and weight and balance. Air New Zealand has posted earnings before taxation for the 2018 financial year of NZ$540 million, an increase from the prior year result of NZ$527 million, representing the second highest profit in the airline’s history. Net profit after taxation grew 2.1% to NZ$390 million. To deliver greater schedule reliability for customers going forward, Air New Zealand will be leasing three widebody aircraft, two Boeing 777-200s and one Boeing 777-300, as well as making adjustments to its schedule as the airline continues to work through the maintenance requirements associated with the global Rolls-Royce Trent 1000 engine issues. 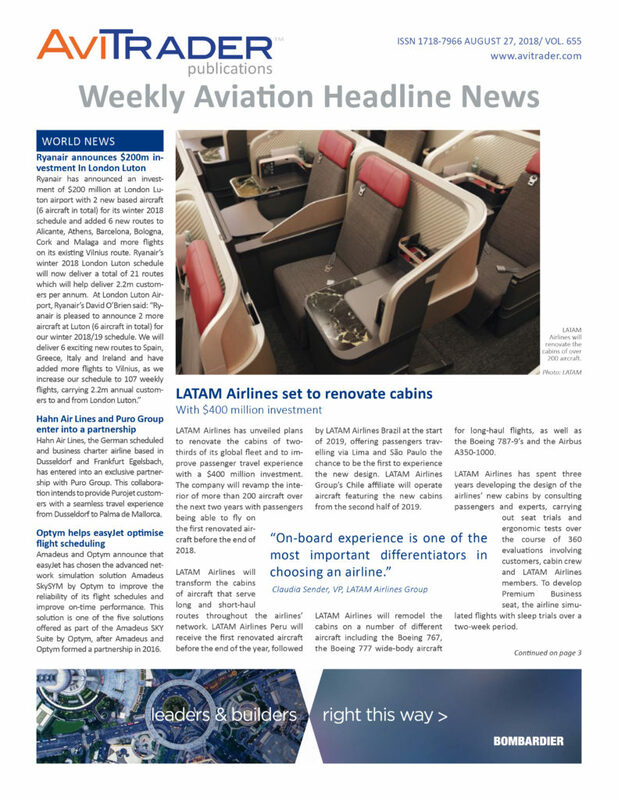 "The adjustments to our schedule will essentially free up two widebody aircraft enabling us to provide greater schedule certainty for customers. This will include adjusting weekly frequency on our Buenos Aires and Taipei services, as well as seeking to retime our flights to Tokyo's Haneda Airport. We are confident that these proactive steps will result in better reliability for our customers," said Chief Executive Officer Christopher Luxon. Dallas Aeronautical Services has appointed Terry Cooper as its new General Manager and welcomed him to the DAS team. Cooper brings more than 30 years of aviation knowledge to DAS. His experience ranges from working with bonded structures and sheet metal assemblies, to quality control, both in the corporate and commercial markets.